Join a discussion around sewable, soft, and wearable electronics for the hobby and handmade level. Learn how to make your own light up Valentine cards by using copper tape, a battery and LEDs! We’ll start by learning some simple paper circuitry and a basic understanding of how circuits work. No soldering is required. Join us at Sparkfun and create an awesome popup valentine that lights up! You'll learn how to set up the electronics (copper wiring, conductive paint, batteries, switches and LEDs), work with lots of paper and craft materials and laser cut pop-ups (or make your own). Learn how to make your own light up holiday cards by using copper tape, a battery and LEDs! We’ll start by learning some simple paper circuitry and a basic understanding of how circuits work. No soldering is required. This last session of SparkFun's Costume Hacking series is designed to be a work session - bring in your project and get a crafty head start on your Halloween costume with tips and tricks from the Sparkfun team. Join us for part 2 of SparkFun's Costume Hacking series created to help you get started with e-textiles for your costumes. Learn how to work with conductive thread and the LilyPad Arduino to add light and sound effects to your clothing. Learn how to work with conductive thread and the LilyTwinkle to create a light-up Trick or Treat bag. 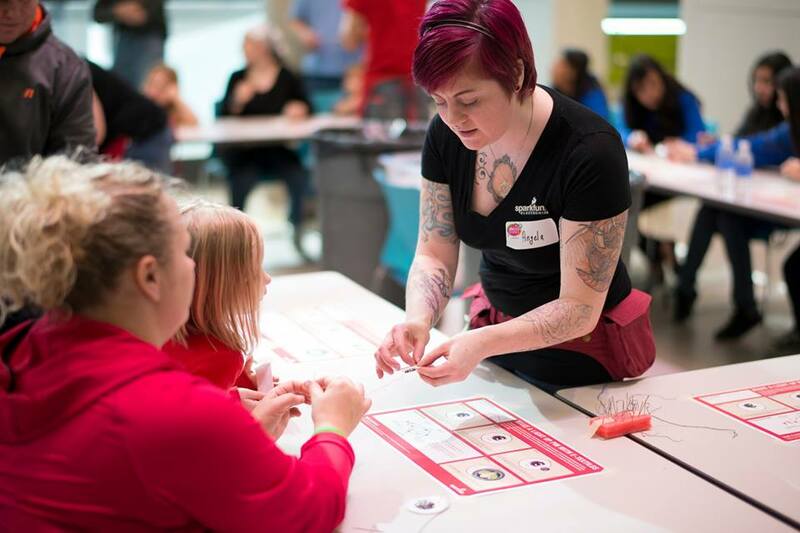 Create your own wearable circuit with SparkFun during Denver Museum of Nature and Science's Science Lounge. Learn how to make your own light up Valentine cards by using copper tape, a battery and LEDs! We’ll start by learning some simple paper circuitry and a basic understanding of how circuits work.